For me the onset of October in Delhi means pulling out all my silk sarees and storing away the cotton sarees. Thats the best part of being in Delhi NCR – distinct weather for which you need to change the fabric of your clothes ! I love winters because I love wearing sweaters, jackets, scarves, socks and shawls. Last year when we were in Himachal, I did raid the Bhuttico showroom in Kullu. Couldn’t resist the shawls that they had. Bhuttico is a cooperative movement with about 500 weavers and the shawls are handwoven. They use sheep wool and Angora wool made from rabbit fur. Angora wool shawls really light shawls but very warm. They have the GI tag, so the Kullu shawl can only be made by them. Since this winter seems less cold, I have just been using the shawls and an odd sweater. Haven’t taken out my favourite jackets yet. 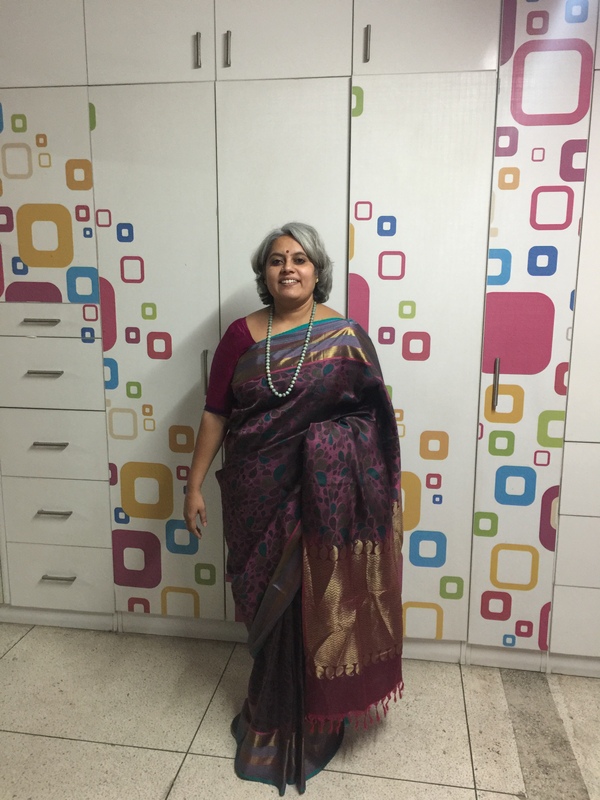 Yesterday I wore this checked silk sari that I had bought at RmKV Bangalore. Love the colours of the checks. I wore a black and white Bhuttico shawl with it. This shawl is really long and wide. Have already written about this sari earlier – paalum-pazhamum checks. Today I wore a sari that I bought at Kumaran stores. Its a Kanchivaram silk saree with some jute silk thread work done on it. The sari looks like it has been printed, but its woven. This was a sari that Krishnan insisted I buy, because he loved the design and the way it looked. I wore it first in Mongolia when we visited Goyo’s mother. I wore it again a few times and today I wore it to the Goonj meeting. I didn’t need the Angora shawl till we were on our way back because again it wasn’t very cold today. 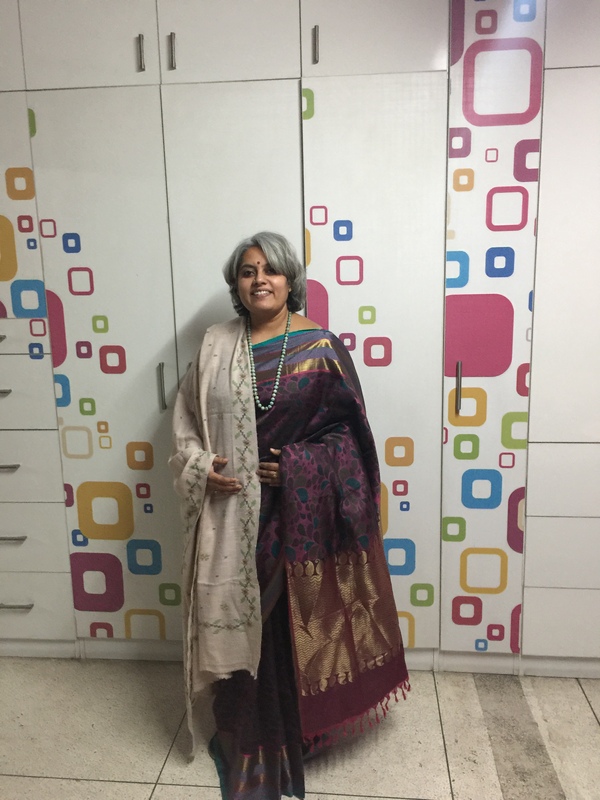 The neckpiece is from Desh Maheshwari and the blouse belongs to another sari, but fits this one just right. Wish the winter intensifies so that I can wear my jackets :):).